It's true. I messed with Texas. Ya'll. 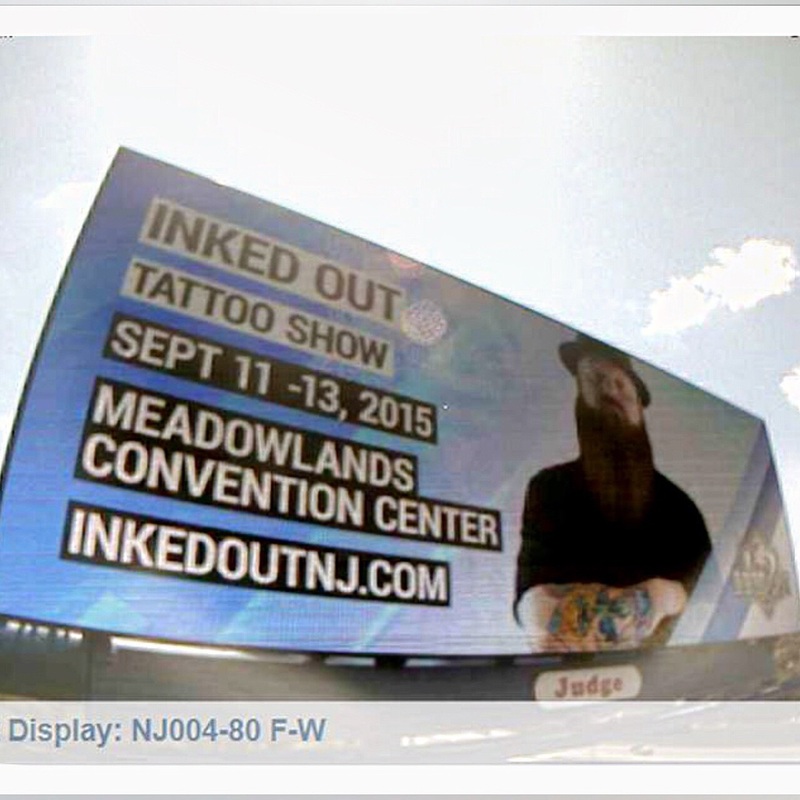 Nothing but fun times at the Ink Life Tour tattoo convention. Maude Cobb Convention & Activity Center in Longview, Texas was the hosting event center this year. There was a whole slu of activities on hand. Not only could you take home a new tattoo but there was a dog rescue in there. Puppies! Bands included Misfits, Puddle of Mudd and Saving Abel. I got the opportunity to share a booth with my friends Kito from Inkmaster Season 6. My bro Jiggy and Dallas artist Sparticus. I watched Sparticus from Artistic Encounters tattoo a killer portrait of Charles Manson on his own Mother. I believe Now, I have officially seen it all. Lol. I want to thank all the fans, friends, fellow tattooers and all the people that treated me so well. I can't wait to come back next year and tattoo Ya'll again. What is a Mandala? And Why do We Get Them Tattooed? 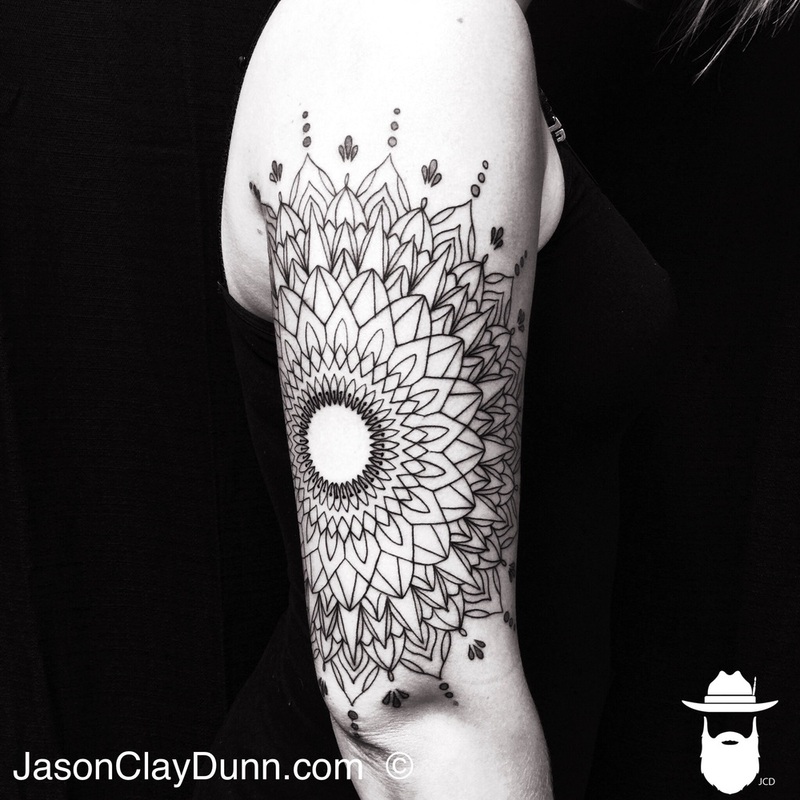 Mandala or Man•Da•La : Is a geometric figure representing the universe. Usually found in Hindu and Buddhism symbolism. These designs although challenging can make a great tattoo design. Often times you will find them done in black dot work or sometimes even in color. When placed properly on the body they can make for a perfect enhancement to adorn the body. The tattoo you see above is the first session outline and will be a part of an ongoing full sleeve tattoo combining japanese peonies and other styles of mandalas. To have a custom mandala created for you, contact me here. Howdy ya'll. Come by the booth and say hello at the Ink Life Tour booth. I will be tattooing. Handing out stickers, Selling shirts and more. See live acts like The Misfits, Puddle of Mudd, Saving Abel. With our favorite host Dr. Blasphemy. Can't wait to journey to Texas! Here's a throw back from 7 years ago. Often I would go out and paint and sell art prints at street fairs or art walks. This one happened to be at the Victoria Gardens in Rancho Cucamonga, California. In this painting I am doing a classic portrait of Salvador Dali and enjoying painting outside. This was done years before I started Tattoo Alchemy and I was working privately at the time out of my professional home studio. It's been a while since I've picked up my Iwata Micron Airbrushes. Maybe I should cleen um up and get to work. In fact, I think I'll take on some painting commissions. Contact Me for a one of a kind piece of art. What does The Matrix and Jason Clay Dunn Have in Common? JCD Fun Fact: Several years ago I worked for a shop in San Pedro, CA. I worked with Ethan Morgan (former owner) from So Cal Tattoo. One day a beautiful lady walked in and asked me for a squigly tribal like design off a sheet of flash. We actually used to do flash back in those days. I believe it was around 1999. Turns out this beauty is the daughter to the late great singer, Marvin Gaye. Her name: Nona Gaye. We got along great. Did the small tattoo and off she went into the world. Fast forward several years to 2003. It was the opening day to The Matrix Reloaded. Me being the nerd I am guranteed me an earlybird seat. Low and behold to my surprise, I see a tattoo that is about 6 foot high on the screen. It took me a minute to remember doing that tattoo out of hundreds in the past. It was Nona playing the part of Zee in the movie. I wish she'd let me give that thing a fix up after all these years. Hello everyone! Kansas City was such a success that I have decided to go on over to the Louisville, Kentucky Villian Arts Convention. Please come by my booth and say hello! Friday is my Birthday, so wish me a happy 41. Please and Thank You. I am looking forward to seeing what Kentucky is all about. Contact me to book an appointment. I am starting to travel more these days. I am so curious to meet people in different areas of the US. I am looking forward to seeing Kansas City, Missouri. Please come on out and welcome me to your city. 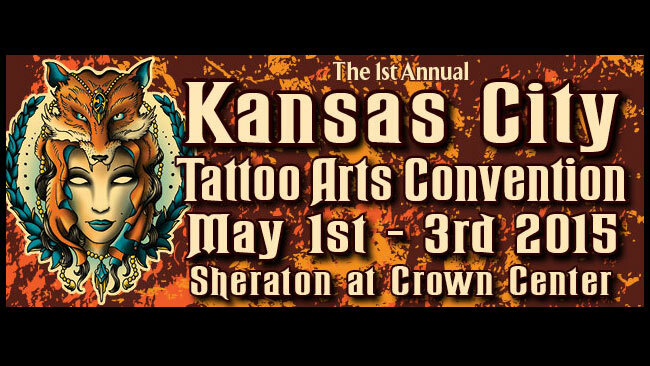 Join me by going to the Villian Arts 1st annual Kansas City Tattoo Arts Convention. Come by the booth and say hello. I will have stickers and shirts available for purchase. A Daruma doll is a hollow and round traditional doll. This is a Japanese tradition. They are modeled after Bodhidharma other wise known as a Dharma doll. He was the founder of the zen buddhist sect. I love these little dolls. Daruma dolls are seen as a symbol of perseverance and good luck, making them a popular gift of encouragement. Darumas are still usually made of papier-mâché, have a round shape, weighted at the bottom so that they will always return to an upright position when tilted over. This characteristic has come to symbolize the ability to have success, overcome adversity, and recover from misfortune. This is why they make for a cool tattoo idea with a neat little meaning behind them. The eyes of Daruma are often blank when sold. The recipient of the doll fills in one eye upon setting the goal, then the other upon fulfilling it. In this way, every time they see the one-eyed Daruma, they recall the goal. There is also a burning ceremony for these dolls at the end of the year, people go to the temple where they received them and this is called Daruma Kuyo. They give thanks to the doll, purchase new ones and send them on there way burning them with all sorts of other figures and dolls. I really love to put my little twist on these lil guy's and make them fun for tattooing. There are so many different ways to do this tattoo and I would love to do one custom just for you. Contact me to get your very own.